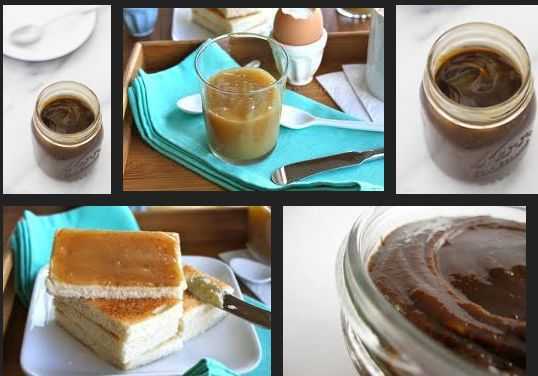 Coconut jam is a traditional high-sugar coconut food product in the Philippines, commonly used as a dessert, bread spread, and rice cake topping. It is light to dark brown in colour, thick yet spreadable in consistency, with a rich, creamy coconut flavour. It is traditionally prepared by cooking sweetened coconut milk to a very thick consistency at low heat with constant stirring. Housewives and small-scale producers generally use brown sugar or ‘panutsa’ (brown sugar moulded in coconut shells). The Food Research & Development Division of the Philippine Coconut Authority improved the process, as reported in the UNIDO/APCC Coconut Processing Technology Information Documents – Part 5 (1980). Twelve mature coconuts are required to prepare 6 standard jam bottles of 450 g. In this process, milk is extracted from grated coconut and water mixed in equal parts. A small portion (1/2 cup or 125 g) of the coconut milk is set aside and citric acid is added at a rate of 0.25% of the total weight of coconut milk. The bulk of the coconut milk is mixed with brown sugar and glucose, at 10.25% and 5.5% of the weight of coconut milk, respectively. The mixture is boiled over low heat with constant stirring for about 20 minutes. The mixture is strained to remove suspended matter, and then boiled over high heat with constant stirring. Just before the mixture thickens, the remaining coconut milk and citric acid mix are added, and cooking is continued over low heat until the mixture thickens. The hot product is poured into sterilized bottles and sealed hermetically. Coconut jam is a creamy, free-flowing, sweetened product, with a moisture content of about 25%, fat 4%, protein 6%, and total solids 75%. i think that it is am amazing recipe but i was wondering long long does it lasts for ?